Princess Nokia’s song “BRUJAS” plays as thesis student and cast member Iyanu Corniel delivers her opening monologue. 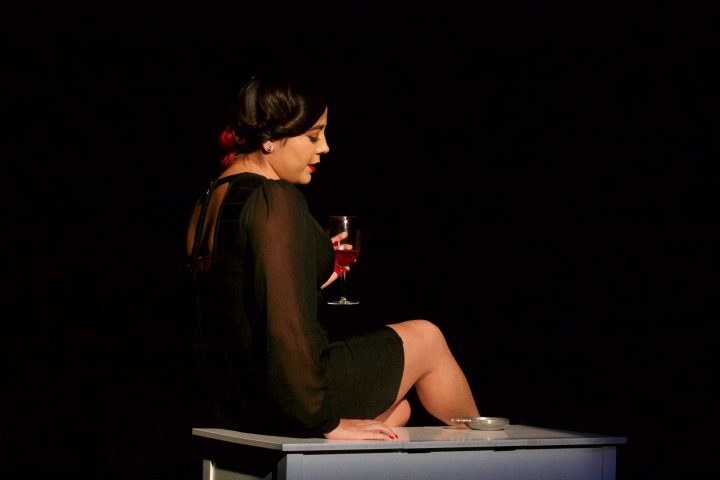 Thesis student Kailah Santos made New College history on Thursday night with the opening of her thesis play “Rebelde: Confessions from Your Dead Abuela,” the first Black Box Theater (BBT) production to feature an all women of color cast. The play adapted three stories by female Puerto Rican writers into an exploration of race, gender and identity through conversations between abuelas y nietas centered around a mirror. Santos began writing “Rebelde” in response to feeling alienated from white-dominated theater culture. Santos’ academic advisor, Associate Professor of Spanish Sonia Labrador-Rodriguez, pushed her to read works by Puerto Rican female writers to inform her Independent Study Project (ISP). Santos began reading some of these short stories and ended up creating a theatrical adaptation of her own. 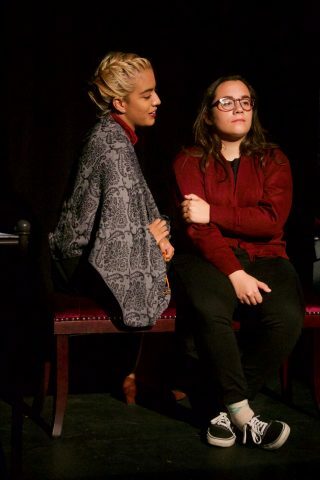 Third-years Paola Baez and Diana Barroeta play grandmother and granddaughter in Kailah Santos’s thesis play. Santos’ adaptation weaved together the themes from the original works–“Pollito Chicken” by Ana Lydia Vega, “Herba Rota” by Mayra Santos and “Una Semana de Siete Dias” by Magali Garcia Ramis–with contemporary characters to discuss how these same issues have been reproduced and passed down through generations. 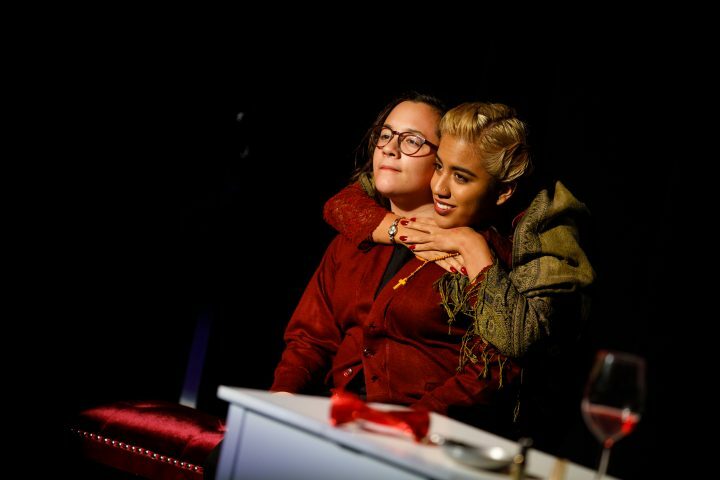 Not only did the “Rebelde” shows serve as a time for audience members to reflect on the characters stories, but it was also an important process for the all women of color cast to process the painful themes in the play that they related to personally. Another song featured on the playlist was “La Negra Tiene Tumbao” by Afro-Cuban salsa star Celia Cruz. Although these issues are not new, the production centers Puerto Rican narratives at a time when the island nation’s deep suffering has never been more visible in the media. More than six weeks after Hurricane Maria, borinqueños are still burdened by lack of federal aid. Third-year cast member Ximena Pedroza plays a grandmother who passes down wisdom to her granddaughter after she dies. Donations were collected after every show to go towards disaster relief efforts for Puerto Rico, grounding “Rebelde” in its purpose to empower and heal from within the greater diasporic community. As for the New College community, “Rebelde” paved the way for other women of color in creative spaces on campus and centered narratives that are too often left out of artistic conversations.